A legendary figure of the Kannada Theater and Cinema. A Kannada stage and screen star. A pioneer of Kannada Cinema who virtually founded it almost single-handedly in the early 1930's . Actor, writer, music composer, producer and director, he was a multi -faceted personality of South Indian Cinema during its early decades. He made films and also acted not only in Kannada but Tamil, Telugu and even Hindi. Such was the veteran of South Indian Cinema, R. Nagendra Rao. Long before Kannada Cinema rose on the horizon in 1934 with '' Sathi Sulochana", he had already acted in the lead role in two films, one in Tamil and the other in Telugu in Bombay which were produced by the pioneer of the Indian talkie, Ardeshir Irani. Such was his enterprise, which created history during the tumultuous period of 1930's. His dash, dynamism and drive were unparalleled in that period in the old Mysore State ruled by a fabulously wealthy maharaja. With little formal education, he made his way to Bombay to begin his film career as actor and later worked hard to establish Kannada Cinema. Before he came into movies he was a stage star and along with M. V. Subbaiah Naidu and Gubbi Veeranna, he formed the legendary trio of Kannada Theater and Cinema. His work won him much fame and recognition reaching far beyond the confines of his home state Karnataka. Indeed during his day he was one of the most popular figures of South Indian Cinema. Such an interesting stage and screen personality was R. Nagendra Rao. To him goes the credit of playing the leading role in the making of the first Kannada-talking picture "Sathi Sulochana" (1934). He not only played the role of the mighty ten-headed Ravana but also composed its music. Another significant achievement of his was the role he played in the production of the first 'dubbed' picture of India, '' Sathya Harischandra" (1943). The historic film was the first movie to be dubbed in this country, from Kannada to Tamil. He not only played the lead role in this film but also directed it and was a partner in the production along with AV. Meiyappan. In a long, distinguished and successful career Nagendra Rao made and acted in many memorable films in more than one language. His performance as villain in the successful Gemini Studios - S. S. Vasan production, " Apoorva Sahotharargal"(1949, Tamil, Telugu and Hindi) won high praise and ranks to this day as one of the finest performances of suave villainy seen in Indian Cinema. His Kannada movies "Premadha Puthri" (1950) and the "Jathaka Phala" (1957) won him great fame and name. Rattihalli Nagendra Rao was born on June 23, 1896 in Holalkare, Chitradurga District in the old Mysore State into a modest Brahmin family. His father Krishna Rao was an employee of the Forest Department of the Maharaja -ruled state. Due to pressures of circumstances Nagendra Rao’s childhood was far from happy. His father gave up his job and took to farming at which he was unsuccessful. Indeed Nagendra Rao had to struggle for his daily meal and lived on the charity of kind- hearted Brahmin souls. (In those days there was a tradition in the Brahmin community by which kind- hearted, affluent Brahmins provided a meal a day in the week for poor Brahmin boys. Each family followed this tradition thus providing the boy with food. They also gifted him clothes keeping him free from worries and to concentrate on the study of Sanskrit, Vedas and such scholarly pursuits. Due to changes in lifestyles and attitudes this custom had vanished...) Even as a mere lad Nagendra Rao showed interest in singing, and coupled with his good looks he seemed to his father to be a perfect choice to go on stage which he thought would at least assure him of his daily meal. He knew a popular stage artist and thanks to him Nagendra Rao joined Kannada Theater as a boy of eight. the first Kannada film released was Sathi Sulochana in 1934. The mere sound of lion's roar at the start of the film had a section of audience falling unconscious. Other fled the theatre thinking a lion had gate crashed into the theatre.Sathi Sulochana," was 16,000 feet long. It was a success and ran house-full forsix weeks in Bangalore and equally well in other places in Mysore State. 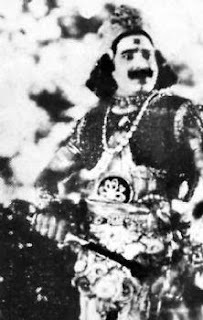 The first hero of Kannada cinema was Subbaiyanaidu.